Contestants during the Brain Brats grand finale. After a month and a half's knowledge battle at Brain Brats, the knowledge warriors finally took the competition head-on from where the nation got its champions from each class. Participants along with their parents and teachers started queuing up outside the venue from 11 am on the day of the Brain Brats' Grand Finale with great enthusiasm and anticipation. All the participants were in Champion red T-shirts provided by Champs21. It was a different experience altogether, said a parent of a Class III participant after the end of the show, a digital exam room with no pen and paper involved. “My child is lucky to be a part of this entire experience; we have seen this type of exams abroad. Thank you Champs21 for introducing this concept to Bangladesh,” he said. According to her, the arrangements made by The Daily Star and Champs21 were flawless. She also mentioned that these types of initiatives should be taken more often to promote the good sides of internet among the youth of Bangladesh. The exam room consisted of sixty laptop computers. Students were seated in their designated seats and attempted 45 questions in 30 minutes in the Grand Finale of Brain Brats on March 12, 2011 at the Bangabandhu International Convention Centre. Brain Brats was an interschool competition conducted online, where students from Dhaka, Chittagong, Sylhet and Rajshahi logged in for free, and competed with each other to win a study tour to Kuala Lumpur with their mothers. The competition was jointly organised by The Daily Star and Champs21, the first Bangladeshi e-learning service. A total of 45 English medium schools participated in the competition nationwide. Brain Brats 2011 consisted of three rounds: the online round, the school grooming round and the Grand Finale where students were tested on three different subjects: Math, Science and General Knowledge. The first round lasted for almost a month, while the grooming round by the school ended on March 9 this year. One or two top performers in the class had the opportunity to take the final on March 12, 2011 at Bangabandhu International Conference Centre and win the title for themselves and their schools. The total number of hits on the competition portal has been higher than any conventional quiz portal, and during the first round, the students from participating schools took more than 1,50,000 test attempts to prove their wits among the peers. 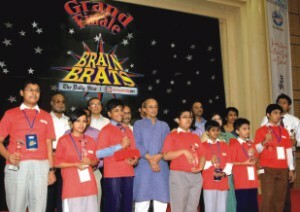 Two hundred and ten finalists participated in the Grand finale of Brain Brats 2011 from class III to Class X, from where a champion from each class was selected at the award ceremony of the Grand Finale. Champions of the Brain Brats knowledge centre with guests and organisers. Soumyjit Guha first came to know about this unique competition through advertisements in The Daily Star. He is a Champs21 subscribed user from before, and a regular at the site. Champs21 has introduced a unique opportunity for students of Bangladesh to learn with fun. Being a student of South Breeze, Soumyjit feels privileged because he gets the best quality teachers and study materials but students who are less privileged can now get access to the best quality of Education through logging into Champs21.com. It is a great initiative and a great tool to engage students with their teachers. On top of that, Champs21 offers a complete lifestyle package, which includes a personalised home page for the students where they can spend their time reading online story books like Gopal Bhar, NasirUddin Hojja and so on. The extra Academic section also offers Jokes and different facts to improve a child's general knowledge; a forum where students of same class can write to each other. “Champs21 is my new facebook, where I can have fun and learn at the same time,” said a participant of the Grand Finale. The overall impressions of the students, teachers and parents were positive. Since it was the first time a competition like this has taken place in Bangladesh, it is likely to have flaws. However none of the students faced difficulties of any sort. The Daily Star and Champs21 team showed up to the participating school fully equipped with LCD monitors, laptops and projectors to give the participants a full demo of the contest. That phase was named as “School Activation”, where The Daily Star and Champs21 team visited all the Brain Brats participating schools to answer to all the queries of the participants. According to a lot of students if the school activation had not been carried out by The Daily Star and Champs21 team, they would have had major problems understanding the modality of the competition. The award ceremony of the Grand Finale was carried out by the presence of the distinguished guests such as Architect Yeasfesh Osman, Honorable State Minister for Science and Information and Communication Technology, Taufiq Elahi Honorable Adviser to the Prime Minister and Mahfuz Anam Editor and Publisher of The Daily Star. The jewels that shone throughout the evening in the sparkling light of the hall are the participants of Brain Brats. They have fought hard throughout the competition in a hunger for knowledge, proving that success comes due to hard work and dedication. For all who have not made it to the podium, they were wished all the very best for next year's competition by the guests.